On 1 July 2016, thousands of volunteers took part in a modern memorial to mark the centenary of the Battle of the Somme. "we’re here because we’re here" was a UK-wide event commissioned by 14-18 NOW, conceived and created by Turner Prize-winning artist Jeremy Deller in collaboration with Rufus Norris, Director of the National Theatre. 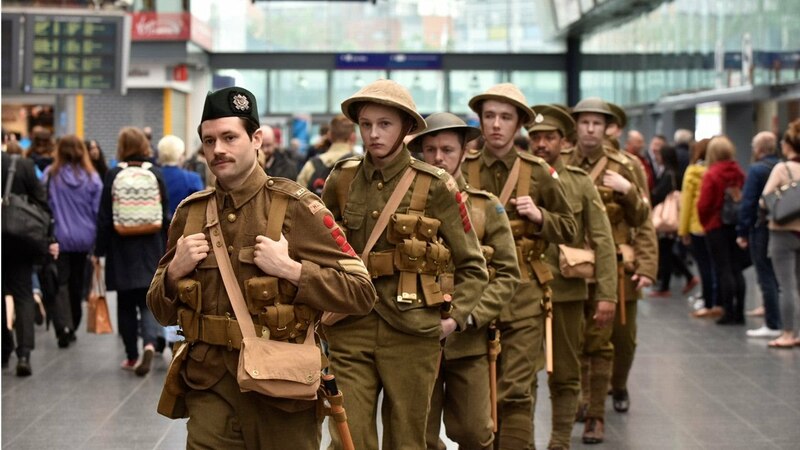 On behalf of The Royal Exchange Theatre, I spent the day following two groups of soldier ghosts around Manchester, watching their interactions with curious, bemused and, sometimes, emotional members of the public. This was the first time I've have to sign a confidentiality agreement before a job and I'm not surprised. The amount of planning which went into this event was staggering. Quite the most rewarding photographic experience I've had.